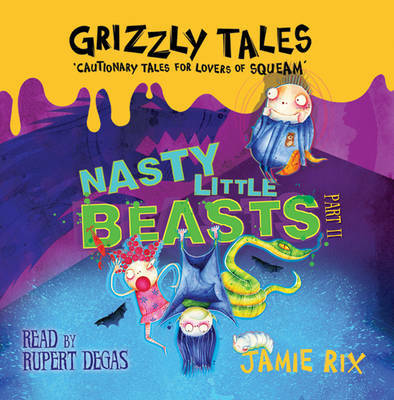 Oh, where to start with this hysterical collection of cautionary tales for children? First off, it's narrated by Rupert Degas, my favorite audiobook narrator of all time (he reads the first four Skulduggery Pleasant audios), and here, he really cuts loose. It is over-the-top, no-holds-barred reading, and he does all the voices so distinctly that it's like listening to a multicast version of a radio play - but it's all Degas. He does the deranged innkeeper (of the Hothell Darkness, where the bad kids go), complete with maniacal laughter, the bratty children, the bewildered, ineffectual parents - it is too, too funny. And then there are the stories themselves - cautionary tales about kids with such awful behavior that it is great fun to see them get their well-deserved comeuppance. Listeners who possess a twisted sense of humor are sure to enjoy this collection of dreadfully delightful tales. The premise is that bad children end up at the Hothell Darkness, and the reader is a visitor (or perhaps about to be a permanent resident) of that horrible place. The innkeeper regales us with tales of the other children whose deeds were so awful as to consign them to the hotel...forever. There is the little boy who is so jealous of his baby sister that he wishes for the wolves to get her - all the while acting like a bratty baby in order to get as much attention as possible. And there is the boy who delights in frightening his little sister, each fright more horrible than the last, culminating in the purchase of a snake to truly terrify her. The new pet grows and grows and grows...with some very interesting results. There's a little girl who refuses to eat fruit, and one day she finds herself in the body of a fruit bat. And there is, perhaps, the brattiest child of all - a horrifically shrill little girl who always gets what she wants - until one day she finds that she really, really doesn't want what she gets. The parents in these stories are rather dim-witted, for the most part, and I found myself wishing there were a special wing of the Hothell reserved just for them. 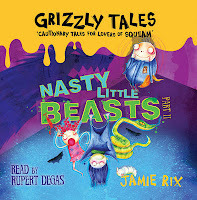 The publisher recommends this for ages four to eight, but I think that younger children might not really appreciate the humor here, and the voices are sometimes rather scary. I think eight to twelve is a more appropriate age range, and my ten and twelve-year-olds enjoyed this immensely on a recent long car ride (as did my husband and I). 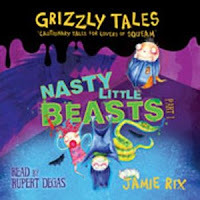 Fans of Hilaire Belloc's cautionary tales will doubtless enjoy this, and I highly recommend the audio version - the vivid narration made us all feel as though we'd seen a film, rather than listened to a book. It would be fun to play a few of these stories for some children on a dark, Halloween night. Heh heh heh. Have you reviewed this book? Let me know, and I'll link to your review.